Unlike the Arctic, which at its centre is an ocean, Antarctica is a landmass that is surrounded by the Southern Ocean. A permanent, massive ice sheet on Antarctica covers 98% of the continent and is containing the major freshwater reserves of the globe. Moving permanently towards the coasts, these ice masses, when gliding over the continental shelf, form huge flat areas of continental shelf ice, of which enormous icebergs can calve into the sea. Outside the shelf ice (fresh water ice), each southern winter an extensive ring of sea ice (salt water ice) is building and surrounding Antarctica. 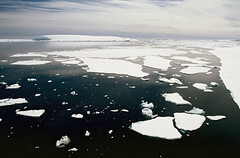 On the picture a mixture of small ice pieces originating both from shelf as well as sea ice is melting and drifting into the sea. If climate change is escalating and more of Antarctica's ice sheet is melting it would contribute to major sea level rise.